The painting above is by John James Barralet, an Irish artist who spent the final years of his career in the United States. The painting is often called the “Apotheosis of George Washington,” i.e. Washington’s divinization. The first version of the painting appeared in 1802, three years after Washington’s death. 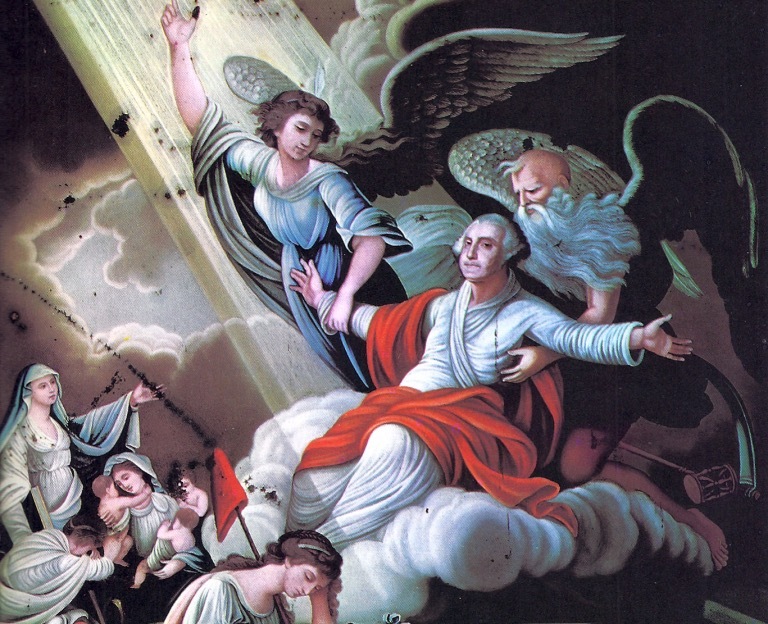 It shows President Washington, as America’s first civil religion saint, being taken up into heaven by an angel and Father Time. Another “Apotheosis of Washington,” painted right after the Civil War, by Constantino Brumidi in 1865, is found in the eye of the US Capitol Rotunda. It depicts President Washington rising to the heavens in glory, flanked by female figures representing Liberty and Victory. Some have argued, and still do, that Christianity is the national American faith. Others that Christianity, the Deism of the founding fathers, and other religious traditions in the United States have long inspired Americans in a rather generalized religion of the American Way of Life. My observation this week is that there is indeed an elaborate and well-institutionalized civil religion in America, alongside of and clearly differentiated from the established religious traditions. The words and acts of the founding fathers and our first few presidents shaped the form and tone of American civil religion as it has been maintained ever since. American civil religion is a deeply felt and strongly patriotic universal religion of the nation. It does not compete with established religions but exists alongside them and is supported by them. It is all part of the American way of religion. People growing up outside the United States, like my European friends, cannot understand it, because they have had very different experiences of religion. I am not being arrogant, but there is something unique about the American experience. (1)	A god or a transcendent principle. (2)	Sacred objects and symbols that support and unite people in their beliefs. (3)	Holy days and rituals that unite people and link them with the transcendent. (4)	Religious leaders like priests or ministers. (5)	Sacred places and shrines. (6)	Saints or heroic sacred people. (2)	Holy objects like the American flag and the dollar bill. And a belief in America itself as an object of religious devotion. (3)	American holy days like the Fourth of July, Memorial Day, Thanksgiving, etc. (4)	In many ways, the U.S. president – who becomes president with his hand on the Bible — functions as a kind of national high priest. FDR clearly functioned this way with his New Deal program and fireside chats. (5)	Sacred Places like the Lincoln Memorial, Arlington National Cemetery where the “martyrs” are buried, Washington Monument, Mount Rushmore, etc. Up until the Civil War (1861 – 1865), American civil religion focused, above all, on the American Revolution. It was the final act of the Exodus from the old world across the sea. The Declaration of Independence and the Constitution were considered new sacred scriptures; and Washington was the divinely appointed new Moses who led his people out of the old world tyranny. With the Civil War, new themes of death, sacrifice, and rebirth enter American civil religion. They are symbolized in the life and death of President Abraham Lincoln; and, at the end of the Civil War, in a series of national, civil religion, Holy Week events: Confederate General Robert E. Lee surrendered to Union General Ulysses S. Grant on April 9, 1865 — Palm Sunday. When he was shot on Good Friday, April, 14, President Lincoln shed his blood for his country. Lincoln died on Saturday and so, on the following day — Easter 1865, “Reconstruction” resurrection began under President Andrew Johnson. Following the Civil War, the great number of war dead required the establishment of several national cemeteries. Of these, Gettysburg National Cemetery, which Lincoln’s famous address served to dedicate, has been overshadowed only by the Arlington National Cemetery, begun on the Robert E. Lee estate across the river from Washington. Memorial Day grew out of the Civil War. Memorial Day integrates people and local communities into a national observance, just as Thanksgiving Day, which was institutionalized as an annual national holiday under the presidency of Lincoln, serves to integrate families into an American civil religion celebration of unity and gratitude for the blessings of Divine Providence. As I mentioned last week, post WWII America was fertile ground for American civil religion; and President Dwight David Eisenhower its strong advocate. With the support of people like the Rev. Norman Vincent Peale and the Rev. Billy Graham, Eisenhower presided over a vigorous assertion of the place of religion in public life. Even when, as he said, he didn’t care what the religion was. He established the annual “presidential” prayer breakfast, and the presidential practice of ending speeches with “may God bless America.” With Eisenhower’s support, Congress inserted “under God” into the Pledge of Allegiance and placed “In God We Trust” on all currency. Few Americans opposed such steps. Protestants and Catholics were happy, and Jewish Americans felt they could live with Eisenhower’s vague public religiosity. A very popular civil religion spin-off at this time was the Rev. Norman Vincent Peale and his “Positive Thinking” religio-psychiatry. Peale, who died in 1993, was probably the most famous clergyman in the United States in the 1940s and early 1950s. When Donald Trump was a child, the Trump family regularly attended Peale’s Marble Collegiate Church in Manhattan. Years later, Peale presided over Trump’s first marriage to Ivana in 1977. It was Norman Vincent Peale, by the way, who taught Donald Trump to promote and worship himself. Since the early nineteenth century, American civil religion has been predominantly activist, moralistic, and social rather than contemplative or theological. American civil religion has never been anticlerical or militantly secular. It has consistently borrowed from set religious traditions in such a way that the average American has seen no conflict between the two. In this way, civil religion, with no opposition from the churches, has been able to construct powerful symbols of national solidarity and to activate deep levels of personal engagement for the attainment of national goals. I am not opposed per se to private schools; but one really must also acknowledge here the contribution of public schools as shapers of civil religion values. They should not disappear. Sustaining the whole panorama of American civil religion are key biblical archetypes: Exodus, Chosen People, Promised Land, New Jerusalem, and Sacrificial Death and Rebirth. But how should people understand these themes today? Do they correctly understand them? Even Robert Bellah observed years ago that “civil religion has not always been invoked in favor of worthy causes.” Today we see it being used in a rather fanatic fundamentalist way to justify racism, police brutality, homophobia, misogyny, and xenophobia. And there will always be people like Pat Robertson, who said this week on the 700 Club: “You can’t trust those liberal colleges to educate your kids. You send your son to a liberal college and he’ll come back as a transgender, who believes satanic lies like evolution and global warming.” The wax nose of civil religion? Next week, my final reflection on the themes of religion, faith, and civil religion …..and the challenges ahead. Yes, where do we go from here? For some reason I associate this with an opera singer who went into comedy and in one of her routines mention the book, THE POWER OF BEING A POSITIVE STINKER. Do you remember who that was? Don’t remember….but there are a lot of stinkers! Excellent and quite valid reflection! Well thought through and stated. Very insightful. Thank you, Jack. Very thought provoking, Jack. Hope there is more good than bad in being so “Godly” as a country. We could write a book on exaggerations and highjacking God for our country’s actions.